The Byzantine Empire was the predominantly Greek-speaking continuation of the Roman Empire during Late Antiquity and the Middle Ages. 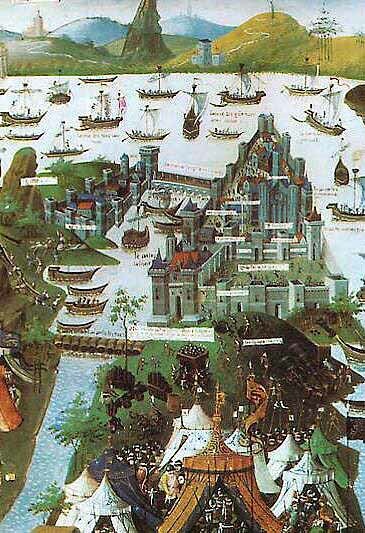 Its capital city was Constantinople (modern-day Istanbul), originally known as Byzantium. 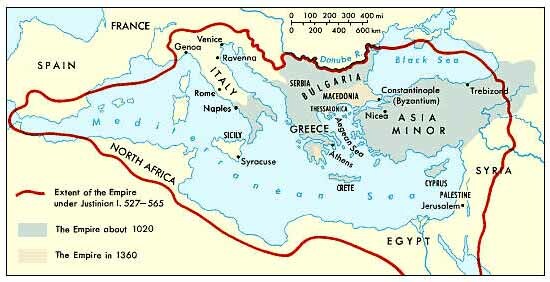 Initially the eastern half of the Roman Empire (often called the Eastern Roman Empire in this context), it survived the 5th century fragmentation and collapse of the Western Roman Empire and continued to thrive, existing for an additional thousand years until it fell to the Ottoman Turks in 1453. During most of its existence, the empire was the most powerful economic, cultural, and military force in Europe. Both "Byzantine Empire" and "Eastern Roman Empire" are historiographical terms applied in later centuries; its citizens continued to refer to their empire as the Roman Empire. 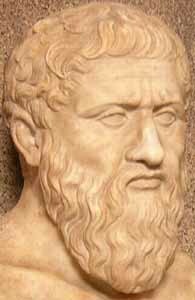 Several events from the 4th to 6th centuries mark the transitional period during which the Roman Empire's east and west divided. In 285, the emperor Diocletian (r. 284-305) partitioned the Roman Empire's administration into eastern and western halves. Between 324 and 330, Constantine I (r. 306-337) transferred the main capital from Rome to Byzantium, later known as Constantinople ("City of Constantine") and Nova Roma ("New Rome"). 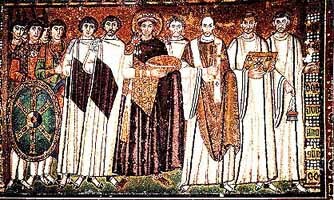 Under Theodosius I (r. 379-395), Christianity became the Empire's official state religion and others such as Roman polytheism were proscribed. And finally, under the reign of Heraclius (r. 610-641), the Empire's military and administration were restructured and adopted Greek for official use instead of Latin. In summation, Byzantium is distinguished from ancient Rome proper insofar as it was oriented towards Greek rather than Latin culture, and characterised by Orthodox Christianity rather than Roman polytheism. The borders of the Empire evolved a great deal over its existence, as it went through several cycles of decline and recovery. 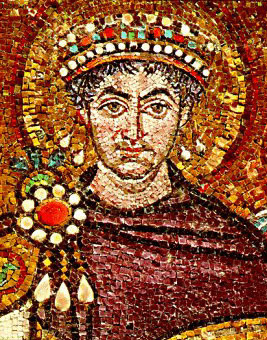 During the reign of Justinian I (r. 527-565), the Empire reached its greatest extent after reconquering much of the historically Roman western Mediterranean coast, including north Africa, Italy, and Rome itself, which it held for two more centuries. During the reign of Maurice (r. 582-602), the Empire's eastern frontier was expanded and the north stabilized. However, his assassination caused a two-decade-long war with Sassanid Persia which exhausted the Empire's resources and contributed to major territorial losses during the Muslim conquests of the 7th century. During the Macedonian dynasty (10th-11th centuries), the Empire again expanded and experienced a two-century long renaissance, which came to an end with the loss of much of Asia Minor to the Seljuk Turks after the Battle of Manzikert (1071). The final centuries of the Empire exhibited a general trend of decline. It struggled to recover during the 12th century, but was delivered a mortal blow during the Fourth Crusade, when Constantinople was sacked and the Empire dissolved and divided into competing Byzantine Greek and Latin realms. Despite the eventual recovery of Constantinople and re-establishment of the Empire in 1261, Byzantium remained only one of several small rival states in the area for the final two centuries of its existence. This volatile period led to its progressive annexation by the Ottomans over the 15th century and the Fall of Constantinople in 1453. In 468 an attempt by Leo I to conquer again Africa from the Vandals had failed mercilessly, showing how feeble were the military capabilities of the Eastern Empire. At that time the Western Roman Empire was already restricted to the sole Italy: Britain had fallen to Angles and Saxons, Spain to Visigoths, Africa to Vandals and Gaul to Franks. The loss of the southern territories to the Arabs further strengthened Orthodox practices in the remaining provinces.Constans II (reigned 641 - 668) sub-divided the empire into a system of military provinces called th�mata (themes) in an attempt to improve local responses to the threat of constant assaults. A partial recovery was made possible after Manzikert by the rise to power of the Comnenian dynasty. 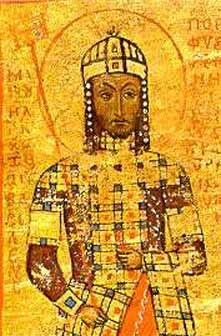 The first emperor of this line, Alexius Comnenus, whose life and policies would be described by his daughter Anna Comnena in the Alexiad, began to reestablish the army on the basis of feudal grants (pr�niai) and made significant advances against the Seljuk Turks. His plea for western aid against the Seljuk advance brought about the First Crusade, which helped him reclaim Nicaea but soon distanced itself from imperial aid. Later crusades grew increasingly antagonistic. The Latin Empire, the Empire of Nicaea, the Empire of Trebizond and the Despotate of EpirusThree successor states were left - the Empire of Nicaea, the Empire of Trebizond, and the Despotate of Epirus. The first, controlled by the Palaeologan dynasty, managed to reclaim Constantinople in 1261 and defeat Epirus, reviving the empire but giving too much attention to Europe when the Asian provinces were the primary concern. = Inside of an ancient garbage pit, archaeologists discovered precious artifacts, including a gold coin and three items inlaid with gold that adorned jewelry. Hundreds of coins, intact lamps and even ancient gold jewelry have been found in Israel, curiously discarded hundreds of years ago in a Byzantine garbage dump. 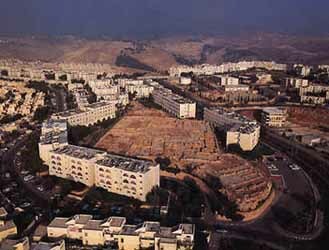 Archaeologists have been excavating the agricultural outskirts of the ancient city of Arsuf, also called Apollonia, just north of Tel Aviv. There, they have found evidence of wine presses, olive presses and traces of buildings used by farmers, but perhaps their most intriguing finds have come out of the Byzantine trash pits at the site. For the development of Byzantine art the inherently conservative medium of Illuminated Manuscripts had a particular importance in preserving ancient traditions. Only a handful of the magnificent books produced in the pre-Iconoclastic period survive, of which the Rossano Gospels (Archiepiscopal Museum, Rossano, Italy), and the famous Vienna Genesis manuscript (Nationalbibliothek) are the outstanding examples; both contain many separate miniatures painted on purple parchment and may be dated to the 6th or 7th century. Byzantine architecture is the architecture of the Byzantine or Later Roman Empire. This terminology is used by modern historians to designate the medieval Roman Empire as it evolved as a distinct artistic and cultural entity centered on the new capital of Constantinople rather than the city of Rome and environs. The empire endured for more than a millennium, dramatically influencing Medieval architecture throughout Europe and the Near East, and becoming the primary progenitor of the Renaissance and Ottoman architectural traditions that followed its collapse. 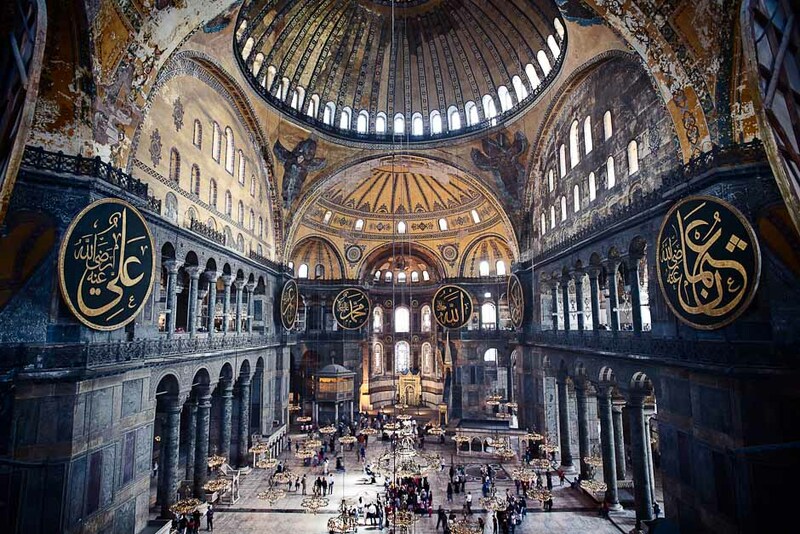 Early Byzantine architecture was built as a continuation of Roman architecture. Stylistic drift, technological advancement, and political and territorial changes meant that a distinct style gradually resulted in the Greek cross plan in church architecture. Buildings increased in geometric complexity, brick and plaster were used in addition to stone in the decoration of important public structures, classical orders were used more freely, mosaics replaced carved decoration, complex domes rested upon massive piers, and windows filtered light through thin sheets of alabaster to softly illuminate interiors. Most of the surviving structures are sacred in nature, with secular buildings mostly known only through contemporaneous descriptions. 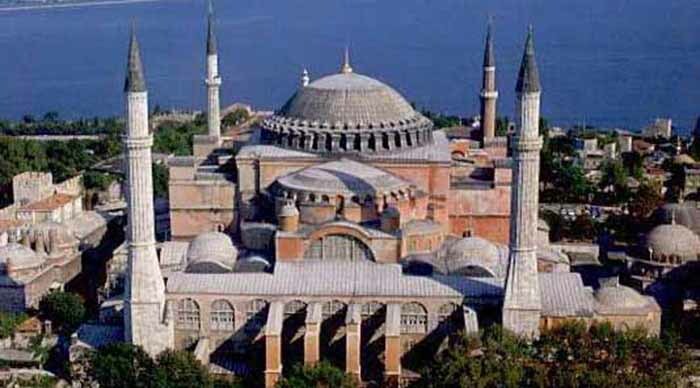 Prime examples of early Byzantine architecture date from Justinian I's reign and survive in Ravenna and Istanbul, as well as in Sofia (the Church of St Sophia). One of the great breakthroughs in the history of Western architecture occurred when Justinian's architects invented a complex system providing for a smooth transition from a square plan of the church to a circular dome (or domes) by means of squinches or pendentives. 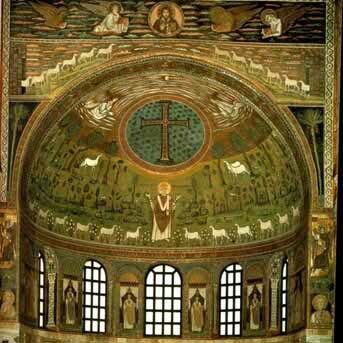 In Ravenna, we have the longitudinal basilica of Sant'Apollinare Nuovo, and the octagonal, centralized structure of the church of San Vitale, commissioned by Emperor Justinian but never seen by him. Justinian's monuments in Istanbul include the domed churches of Hagia Sophia and Hagia Irene, but there is also an earlier, smaller church of Sts Sergius and Bacchus (locally referred to as "Little Hagia Sophia"), which might have served as a model for both in that it combined the elements of a longitudinal basilica with those of a centralized building. Secular structures include the ruins of the Great Palace of Constantinople, the innovative walls of Constantinople (with 192 towers) and Basilica Cistern (with hundreds of recycled classical columns). A frieze in the Ostrogothic palace in Ravenna depicts an early Byzantine palace. Hagios Demetrios in Thessaloniki, St Catherine Monastery on Mount Sinai, Jvari Monastery in present-day Georgia, and three Armenian churches of Echmiadzin all date primarily from the 7th century and provide a glimpse on architectural developments in the Byzantine provinces following the age of Justinian. Remarkable engineering feats include the 430 m long Sangarius Bridge and the pointed arch of Karamagara Bridge. The period of the Macedonian dynasty, traditionally considered the epitome of Byzantine art, has not left a lasting legacy in architecture. It is presumed that Basil I's votive church of the Theotokos of the Pharos and the Nea Ekklesia (both no longer existent) served as a model for most cross-in-square sanctuaries of the period, including the Cattolica di Stilo in southern Italy (9th century), the monastery church of Hosios Lukas in Greece (c. 1000), Nea Moni of Chios (a pet project of Constantine IX), and the Daphni Monastery near Athens (c. 1050). The 11th-century monastery of Hosios Lukas in Greece is representative of the Byzantine art during the rule of the Macedonian dynasty. The cross-in-square type also became predominant in the Slavic countries which were Christianized by Greek missionaries during the Macedonian period. The Hagia Sophia church in Ochrid (present-day Macedonia) and the eponymous cathedral in Kiev (present-day Ukraine) testify to a vogue for multiple subsidiary domes set on drums, which would gain in height and narrowness with the progress of time. As early as the building of Constantine's churches in Palestine there were two chief types of plan in use: the basilican, or axial, type, represented by the basilica at the Holy Sepulchre, and the circular, or central, type, represented by the great octagonal church once at Antioch. Those of the latter type we must suppose were nearly always vaulted, for a central dome would seem to furnish their very raison d'etre. 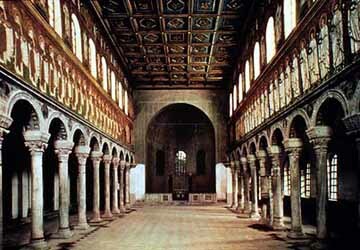 The central space was sometimes surrounded by a very thick wall, in which deep recesses, to the interior, were formed, as at the noble church of St George, Salonica (5th century), or by a vaulted aisle, as at Sta Costanza, Rome (4th century); or annexes were thrown out from the central space in such a way as to form a cross, in which these additions helped to counterpoise the central vault, as at the Mausoleum of Galla Placidia, Ravenna (5th century). The most famous church of this type was that of the Holy Apostles, Constantinople. Vaults appear to have been early applied to the basilican type of plan; for instance, at Hagia Irene, Constantinople (6th century), the long body of the church is covered by two domes. At St Sergius, Constantinople, and San Vitale, Ravenna, churches of the central type, the space under the dome was enlarged by having apsidal additions made to the octagon. Finally, at Hagia Sophia (6th century) a combination was made which is perhaps the most remarkable piece of planning ever contrived. A central space of 100 ft (30 m) square is increased to 200 ft (60 m) in length by adding two hemicycles to it to the east and the west; these are again extended by pushing out three minor apses eastward, and two others, one on either side of a straight extension, to the west. This unbroken area, about 260 ft (80 m) long, the larger part of which is over 100 ft (30 m) wide, is entirely covered by a system of domical surfaces. Above the conchs of the small apses rise the two great semi-domes which cover the hemicycles, and between these bursts out the vast dome over the central square. On the two sides, to the north and south of the dome, it is supported by vaulted aisles in two storeys which bring the exterior form to a general square. At the Holy Apostles (6th century) five domes were applied to a cruciform plan; the central dome was the highest. After the 6th century there were no churches built which in any way competed in scale with these great works of Justinian, and the plans more or less tended to approximate to one type. The central area covered by the dome was included in a considerably larger square, of which the four divisions, to the east, west, north and south, were carried up higher in the vaulting and roof system than the four corners, forming in this way a sort of nave and transepts. Sometimes the central space was square, sometimes octagonal, or at least there were eight piers supporting the dome instead of four, and the nave and transepts were narrower in proportion. If we draw a square and divide each side into three so that the middle parts are greater than the others, and then divide the area into nine from these points, we approximate to the typical setting out of a plan of this time. Now add three apses on the east side opening from the three divisions, and opposite to the west put a narrow entrance porch running right across the front. Still in front put a square court. The court is the atrium and usually has a fountain in the middle under a canopy resting on pillars. The entrance porch is the narthex. Directly under the center of the dome is the ambo, from which the Scriptures were proclaimed, and beneath the ambo at floor level was the place for the choir of singers. 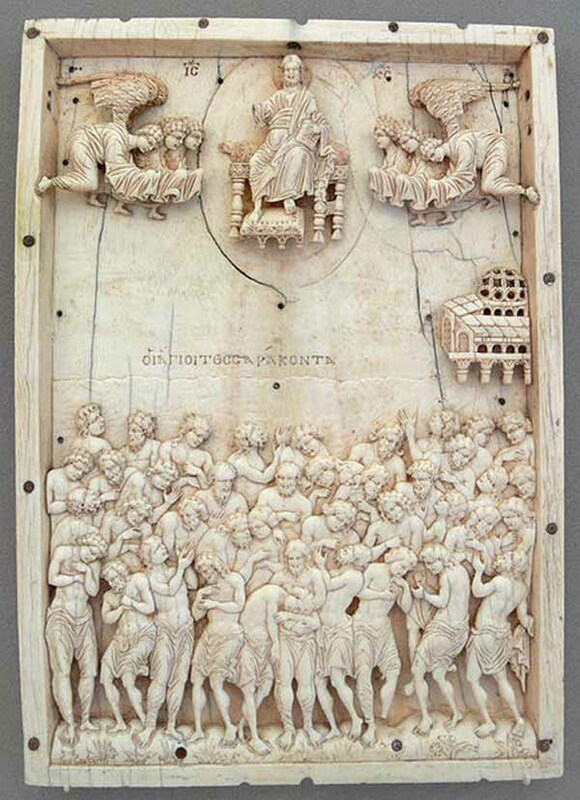 Across the eastern side of the central square was a screen which divided off the bema, where the altar was situated, from the body of the church; this screen, bearing images, is the iconostasis. The altar was protected by a canopy or ciborium resting on pillars. Rows of rising seats around the curve of the apse with the patriarch's throne at the middle eastern point formed the synthronon. The two smaller compartments and apses at the sides of the bema were sacristies, the diaconicon and prothesis. The ambo and bema were connected by the solea, a raised walkway enclosed by a railing or low wall. The continuous influence from the East is strangely shown in the fashion of decorating external brick walls of churches built about the 12th century, in which bricks roughly carved into form are set up so as to make bands of ornamentation which it is quite clear are imitated from Cufic writing. This fashion was associated with the disposition of the exterior brick and stone work generally into many varieties of pattern, zig-zags, key-patterns etc. ; and, as similar decoration is found in many Persian buildings, it is probable that this custom also was derived from the East. The domes and vaults to the exterior were covered with lead or with tiling of the Roman variety. The window and door frames were of marble. The interior surfaces were adorned all over by mosaics or frescoes in the higher parts of the edifice, and below with incrustations of marble slabs, which were frequently of very beautiful varieties, and disposed so that, although in one surface, the coloring formed a series of large panels. The better marbles were opened out so that the two surfaces produced by the division formed a symmetrical pattern resembling somewhat the marking of skins of beasts. Ultimately, Byzantine architecture in the West gave way to Romanesque and Gothic architecture. In the East it exerted a profound influence on early Islamic architecture, During the Umayyad Caliphate era (661-750), as far as the Byzantine impact on early Islamic architecture is concerned, the Byzantine artistic heritage formed a fundamental source to the new Islamic art, especially in Syria and Palestine. There are considerable Byzantine influences which can be detected in the distinctive early Islamic monuments in Syria and Palestine, as on the Dome of the Rock (691) at Jerusalem, the Umayyad Mosque (709-15) at Damascus. While the Dome of the Rock gives clear reference in plan - and partially in decoration - to Byzantine art, the plan of the Umayyad Mosque has also a remarkable similarity with 6th- and 7th-century Christian basilicas, but it has been modified and expanded on the transversal axis and not on the normal longitudinal axis as in the Christian basilicas. This modification serves better the liturgy for the Islamic prayer. The original mihrab of the mosque is located almost in the middle of the eastern part of the qibla wall and not in its middle, a feature which can be explained by the fact that the architect might have tried to avoid the impression of a Christian apse which would result from the placement of the mihrab in the middle of the transept. The tile work, geometric patterns, multiple arches, domes, and polychrome brick and stone work that characterize Islamic and Moorish architecture were influenced to some extent by Byzantine architecture. In Bulgaria, Russia, Romania, Serbia, Georgia, Ukraine, and other Orthodox countries the Byzantine architecture persisted even longer, finally giving birth to local schools of architecture. Neo-Byzantine architecture had a small following in the wake of the 19th-century Gothic revival, resulting in such jewels as Westminster Cathedral in London, and in Bristol from about 1850 to 1880 a related style known as Bristol Byzantine was popular for industrial buildings which combined elements of the Byzantine style with Moorish architecture. It was developed on a wide-scale basis in Russia during the reign of Alexander II by Grigory Gagarin and his followers who designed St Volodymyr's Cathedral in Kiev, St Nicholas Naval Cathedral in Kronstadt, Alexander Nevsky Cathedral in Sofia, Saint Mark's church in Belgrade and the New Athos Monastery in New Athos near Sukhumi. 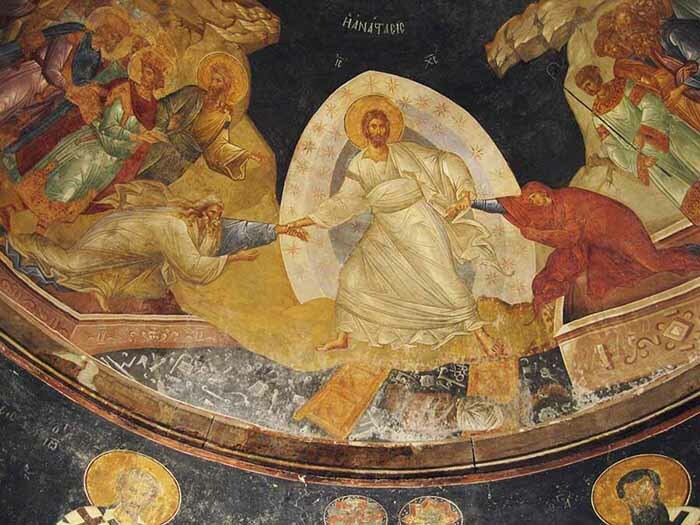 The largest Neo-Byzantine project of the 20th century was the Temple of Saint Sava in Belgrade. Hundreds of years before asbestos became ubiquitous in the construction industry, Byzantine monks used the fibrous material in plaster coatings underlying their wall paintings during the late 1100s, suggests new research in the Byzantine monastery Enkleistra of St. Neophytos in Cyprus. The researchers analyzed some of the paintings on site using various techniques, including infrared, ultraviolet and X-ray fluorescence imaging. 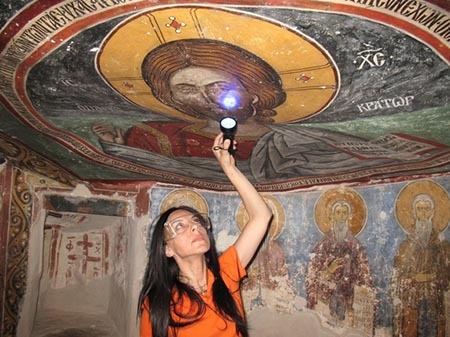 Here, UCLA archaeologist Ioanna Kakoulli examines a painting in the monastery under UV light. 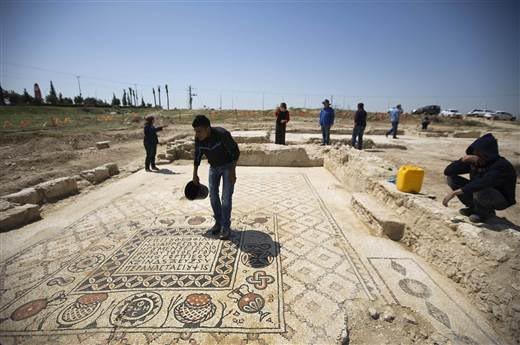 The remains of a 1,500-year-old monastery with intact mosaics covering the floor have been unearthed in southern Israel, the Israel Antiquities Authority announced. The Byzantine complex - which was discovered near Hura, a Bedouin village in the northern Negev Desert - measures 65 feet by 115 feet (20 by 35 meters). It is arranged on an east-west axis, a common feature in Byzantine churches, and a prayer hall and dining room are decorated with elaborate mosaics that show geometric patterns, leaves, flowers, baskets, jars and birds. Byzantium has been often identified with absolutism, orthodox spirituality, orientalism and exoticism, while the terms "Byzantine" and "Byzantinism" have been used as bywords for decadence, complex bureaucracy, and repression. In the countries of Central and Southeast Europe that exited the Eastern Bloc in late 80s and early 90s, the assessment of Byzantine civilization and its legacy was strongly negative due to their connection with an alleged "Eastern authoritarianism and autocracy." 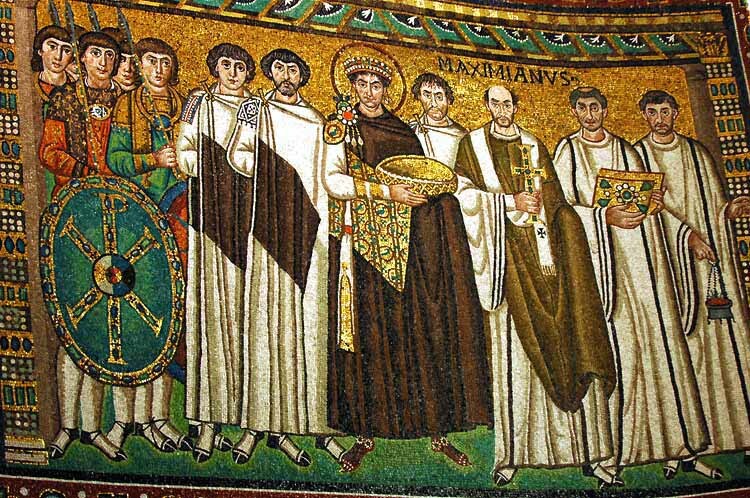 Both Eastern and Western European authors have often perceived Byzantium as a body of religious, political, and philosophical ideas contrary to those of the West. Even in 19th-century Greece, the focus was mainly on the classical past, while Byzantine tradition had been associated with negative connotations. This traditional approach towards Byzantium has been partially or wholly disputed and revised by modern studies, which focus on the positive aspects of Byzantine culture and legacy. Averil Cameron regards as undeniable the Byzantine contribution to the formation of the medieval Europe, and both Cameron and Obolensky recognize the major role of Byzantium in shaping Orthodoxy, which in turn occupies a central position in the history and societies of Greece, Bulgaria, Russia, Serbia and other countries. 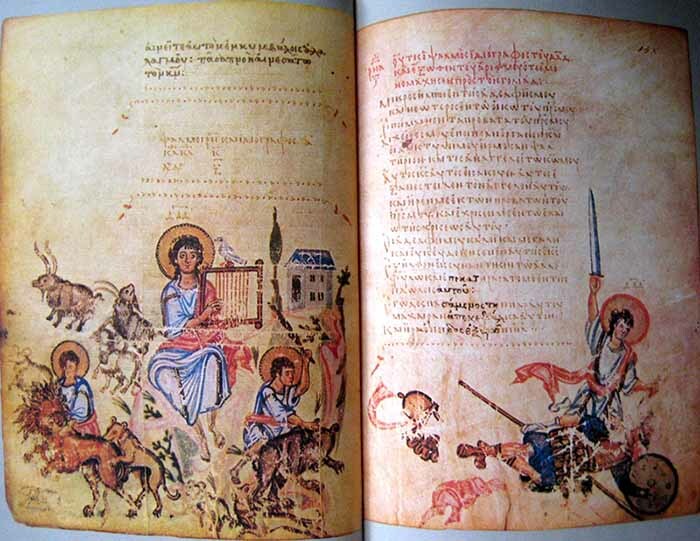 The Byzantines also preserved and copied classical manuscripts, and they are thus regarded as transmitters of the classical knowledge, as important contributors to the modern European civilization, and as precursors of both the Renaissance humanism and the Slav Orthodox culture. 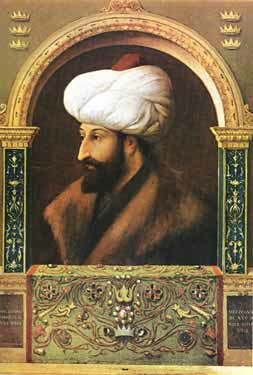 Following the conquest of Constantinople by the Ottoman Turks in 1453, Sultan Mehmed II took the title "Kaysar-i-Rum" (the Turkish equivalent of Caesar of Rome), since he was determined to make the Ottoman Empire the heir of the Eastern Roman Empire. According to Cameron, regarding themselves as "heirs" of Byzantium, the Ottomans preserved important aspects of its tradition, which in turn facilitated an "Orthodox revival" during the post-communist period of the Eastern European states.